Rogers; Pender, Bermingham, Kenna, Guthrie; Guy, Coughlan (Doyle 17), S Byrne (Sinnott 82), Mulcahy; P Byrne, Faherty (Williams 79). B Murphy; Heary, Gray (Burke 79), Shelley, McGuinness; Higgins, A Murphy, Keegan, Brennan; Quigley (Madden 19), J Byrne. 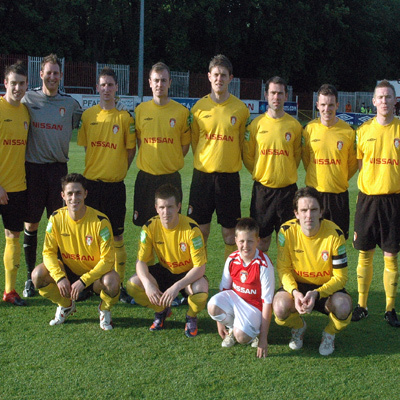 St Pat's claimed three valuable points from a dramatic Premier Division game at Richmond Park. In the presence of Giovanni Trapattoni and Marco Tardelli, Jason Byrne shot Bohs into the lead on 11 minutes but Pat's netted three times before the break. A dramatic spell saw Derek Doyle, Paul Byrne and Stuart Byrne all beat Barry Murphy before the first 45 minutes were up. Pat's lost Gareth Coughlan to injury following a tackle by Mark Quigley and it was later confirmed he suffered a broken leg. Republic of Ireland manager Trapattoni and assistant Tardelli were spectators at this Dublin derby having made a dash across town following the senior team's training game with Gerry Smyth's amateurs. They arrived on 24 minutes so missed a lot of the early action. Pat's started well and on three minutes a Paul Byrne cross from the right was met by Coughlan on the far wing. Coughlan crossed into the box but the well placed Brian Shelley cleared. 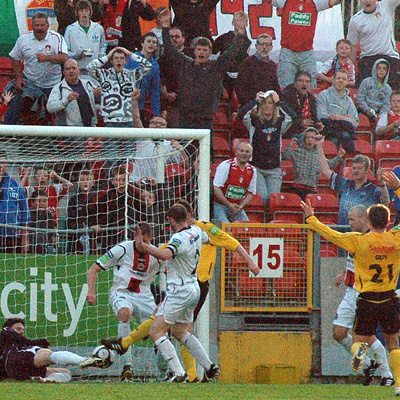 Bohs opened the scoring on 11 minutes. A clearance by Pat's goalkeeper Gary Rogers into the late evening sun was squared for Byrne by Anto Murphy and the one-time Irish international made no mistake with a crisp shot. These games can be explosive encounters and the first hint of trouble came on 13 minutes. 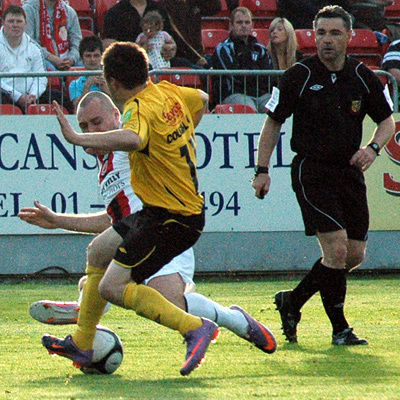 A tackle by former Saint Quigley on Coughlan led to row involving several players from both sides. Coughlan received treatment before being carried off to be replaced by Doyle. Quigley was leniently yellow carded but was soon replaced by Paddy Madden a minute later. It was later confirmed that Coughlan had suffered a double fracture to his right leg with the damage centred on his lower tibia. However, Pat's fought back in fine style and snatched a remarkable 3-1 lead over their bitter rivals before the break. Doyle got them back on level terms on 38 minutes after Bohs keeper Murphy had saved well from Paul Byrne after a cracking cross from David Mulcahy. Byrne himself then put Pat's ahead with a neat finish from close range on 40 following a scramble in the goalmouth after a long free by Derek Pender. With Pat's fans still celebrating the unbelievable turn of events, Stuart Byrne then volleyed in a third from outside the area on 41 minutes. Vinny Faherty went close to netting number four for Pat's on 54 minutes when he turned and fired on target but Murphy was well placed to save his effort. Killian Brennan then directed a good free kick into the Pat's area on 60 minutes. The ball was knocked out to Ruaidhri Higgins in the centre but the former Derry City man rifled his effort high and wide. On 71 minutes, having seen enough, Trapattoni and Tardelli made their way from the director's box. On 86 Rogers dropped the ball during a challenge on Paul Keegan. It fell to Paddy Madden but he fired over the unguarded net.